staying productive during the after college job search! If you checked out my recent post about Being Patient & Trusting Your Journey, you probably know that my after college job search was not an easy one. Not everyone has a job lined up before graduation day and that may result in some unwanted down time when you return home. Though this process can be quite frustrating for many, staying productive during this time can not only help lead you in the right direction but it will definitely take your mind off a lot of the unavoidable stress. Here are 5 ways to keep yourself busy during this transitional period, that will actually be beneficial to your future and career! Update your resume/Linkedin profile: It can never hurt to update your resume while on the job hunt! Make sure that all of the necessary information is included yet concise and remove things that aren’t really relevant for the position. Whoever is looking at your resume/cover letter won't be looking at it for long and if it doesn't stand out within the first 30 seconds, you've most likely lost your chance. A lot of job recruiters will also be checking your LinkedIn profile, so make sure that it is complete and impressive! Attend networking events: What better way to meet potential professional connections than participating in networking events? You never know who you may meet that could potentially help you launch your career. Work out: While I was interning part time and continuing to apply for full time jobs, I had a lot more time to spend at the gym than I do now that I’m working full time. Working out not only relieves stress but it’s important for your health. Take advantage of the free time that you may have now and get fit! Read a book: Reading a lot of career motivational books has definitely helped me move along through my professional journey. I actually read #GirlBoss during my after graduation job search and it really inspired me to keep pushing forward and not give up on my goal. The lessons that I’ve learned from these books will stay with me throughout the rest of my career. Apply, Apply, Apply! : Now this one may seem like a given…but the best advice that I can to college graduates on the job hunt is to never stop applying for jobs. It’s so easy to give up or want to take a break from the application process because nothing seems to be working out. Don’t! The more positions that you apply for, the better your chances are to score an interview and knock it out of the park. I literally applied for around 10 job positions a day and was still only offered a handful of interviews. Imagine how much slower this process will go for you if you’re only applying for 1 job a day! My favorite job search site was Indeed and it’s actually where I found and applied for my current position. New jobs are posted everyday and you can even have positions in the field that you’re interested in sent right to your inbox. There should be no excuses! Stay dedicated to the goal. 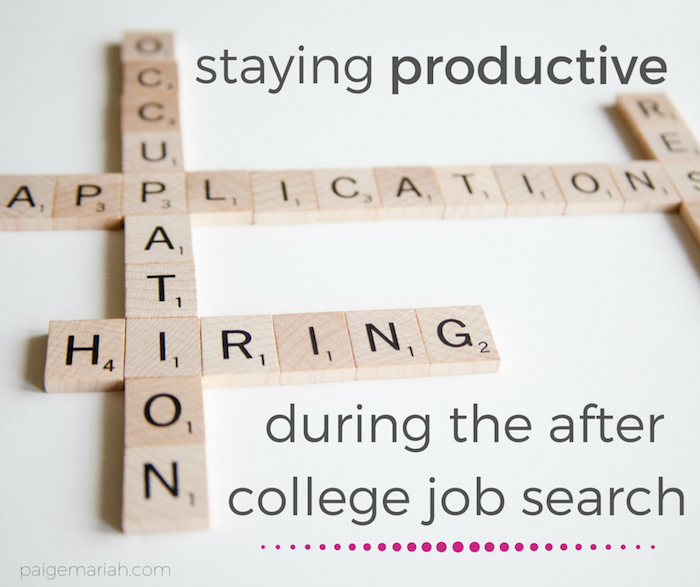 How did you or how are you currently staying productive during the after college job search? Share in the comments!